On the 4th of September 2014, the world learnt that popular comedienne, actress, writer, producer and TV host, Joan Rivers, had passed on at the age of 81. Since I have this habit of reading up things I can find on a dead person especially if they happened to have accomplished a major feat in their lifetime, the death of Joan Rivers was another opportunity for me to go into her world, and find out those things that I would never have found out if was she still in this world of ours. While her show, Fashion Police was not my cup of tea except on those days when there was nothing else to to watch on TV, I would watch the show for the sake of Joan and her take on celebrities style be it on the Red Carpet or in their day-to-day lives. Little did I know that there was more to this candid, hilarious, and sharp-mouthed tongued woman whose life has touched not only those in her network but also vulnerable people in her community. Her colleagues at E! Entertainment and industry, in their tributes to Joan Rivers, spoke about an endearing woman who was responsible for breaking barriers in a male-dominated field like comedy thereby debunking the stereotype that woman can’t be fuuny. She also open doors to other newbies giving them the opportunity to thrive as comedians and comediennes as well. I have learnt that she demonstrated that hard work was a key to success, cared for the needy in her community and lived life the way it was meant to be lived – as a gift to be treasured. Thanks to E! Entertainment specials on Joan Rivers, I also got to discover the woman behind the blunt yet hilarious jokes that people had grown accustomed to and I thought to share some of the exceptional attributes that I have discovered about Joan Rivers, a woman who I doubt will be forgotten any time soon. 1. Work Ethics: Her colleagues at E! Entertainment described how she maintained a high standard of work ethics throughout her 20-year stint at the network. It was said that her daily work routine involved waking up at 3:00 am or getting to the studio at that time and would not leave until about 11:00 pm. She was no doubt on top of her game even at the age of 81 and its somehow difficult to imagine Fashion Police without the witty and good humour of Joan Rivers. 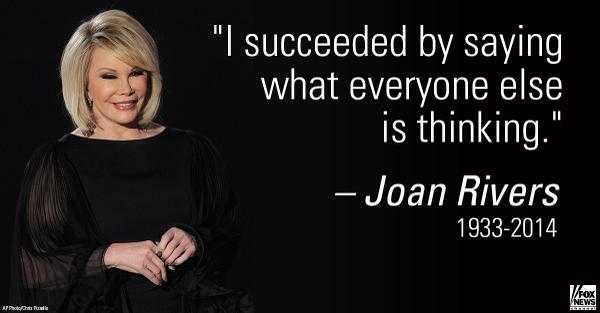 In some of the last interviews she gave, Joan joked about how the concept of retirement eluded her because “comedians are only as good as their last jokes “. She also feared that she would resort to sharing her jokes with the milkman which was not a good retirement alternative for her. She was quoted as saying that fun is waking up and saying “I don’t have a minute free today?” due to a busy work schedule and she worked up untill when she would go for the procedure that would eventually retire her for life. 2. Relationships: The passing away of Joan Rivers has also brought to the fore the fact that she valued the importance of building and sustaining good relationships both at home and at work. While Kelly Osborne, one of her co-presenters on Fashion Police, would always refer to her as the “grandmother she never had” Giuliana Rancic talked about how she was far from just being a colleague but a trusted friend who helped her get through a very dark period in her life. “She was incredibly loving, honest, and lived her life with no regrets. Working with her for the last 13 years has been one of the true joys of my life. She could put a smile on your face, instantly, no matter how hard your day was” said Giuliana in a tribute to her dear. Don’t even get me started on the bond she had with her daughter Melissa and Grandson Cooper as it was a delight to watch on screen. 3. 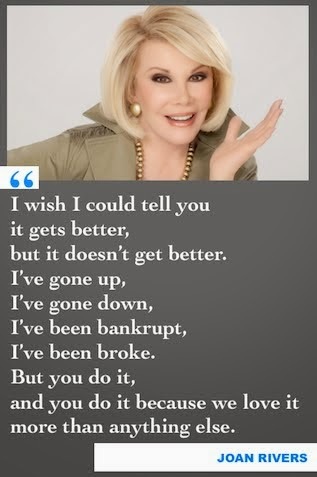 Tenacity: Sometimes you wonder why some people who seem to ‘have it all’ are depressed but Joan Rivers was not one of such people because her tenacity for life and success was unparalleled. While she did have her share of dark days with her husband committing suicide; her daughter not talking to her; a multi-million dollar investment gone bad and a career that seemed to have plummeted liked pricked balloon at the time, yet she found the courage and determination to start all over again and do things differently and better than before. Her book titled ‘Bouncing Back : I’ve Survived Everything…and I Mean Everything…and You Can Too!’ is a great read for days when you find yourself in what seems like a bottomless pit and you are wondering whether life is what living at all. 4. Charitable Works: “You are a fool if you don’t give back” says Joan in the last interview she had with Giuliana Rancic. True to her words, I discovered that that she was a giver in all the sense of the word and has been highly commended for her philanthropic work especially supporting people living HIV/AIDS. I was greatly moved by the story of the charity called ‘Gods Love we Deliver’ were she was a board member for over 25 years. She would also go deliver food to people living with HIV/AIDS and people too sick to cook in her spare time with her daughter and grandson tagging along on Thanksgiving Day. She also donated her $500,000 winnings from the Celebrity Apprentice Reality completion in 2009. Sharing the story brought tears to her eyes and you could see that she was genuinely passionate about the cause of the charity and other human rights campaign that she supported. 5. 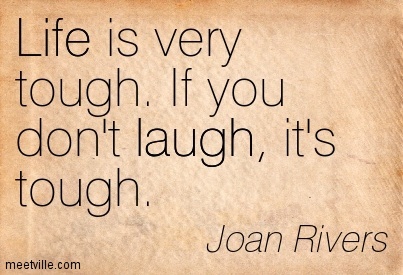 Live, Love and Laugh: I think it is safe to sum up Joan River’s life in these 3 words. She did live a fulfilled life; loved herself and the people in her world without reservations; and laughed her way to the bank by finding ways to laugh at any and every given situation be it good or bad. “Life goes by fast. Enjoy it. Calm down. 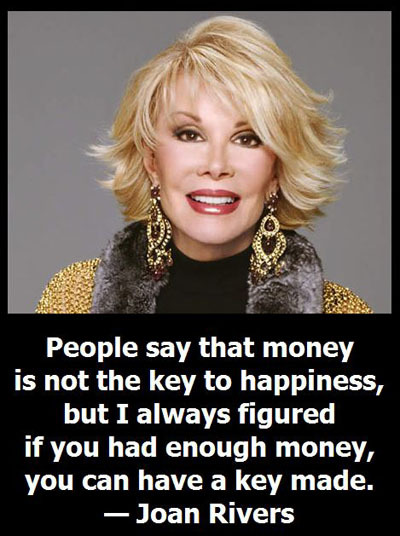 Its all funny”, says Joan Rivers and she may as well be right. ‹ What would you do if you were not afraid? I watched her True E Hollywood story and just like you I was amazed that she had lived such a ‘turbulent’ life @ some point, yet bounced back and lived a full life till she died. I was truly inspired and after then I had probably filed it away somewhere in my mind. Reading this again today reminded me, and a necessary reminder it is.